Everybody is interested in whole grain everything these days. While I am interested in having plenty of whole grains in my diet, I’m not that interested in having things that are enriched with whole grains, like a cereal that has 5% whole wheat flour or something. I like my grains to be either soft and white or totally wheaty. This isn’t to say that I don’t often mix flours for texture and flavor in my breads, because I do. I just don’t call it something it’s not. 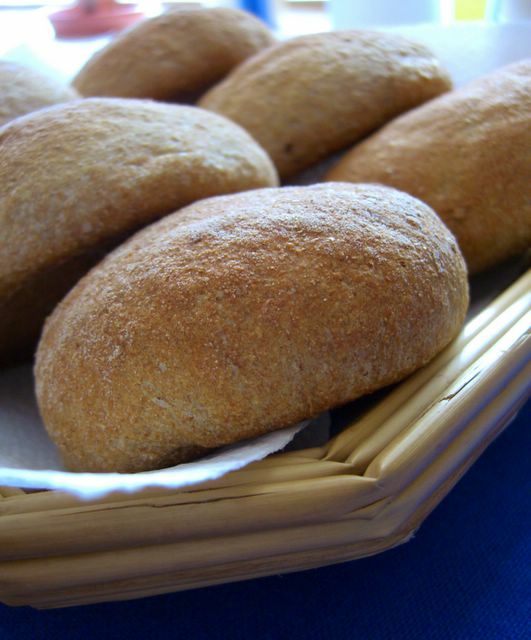 These rolls are exactly what they say they are: 100% whole wheat flour buns. I started off the dough with little direction. I didn’t know whether I wanted to do dinner rolls or a loaf of bread. At some point (most likely while I looked at the ground beef in my refrigerator), I thought “this would make a great hamburger bun.” And so it does. These buns have a great texture, a slightly crisp crust that softens as it cools and a moist, light interior. The rolls are satisfyingly flavorful, with just enough sugar to cover any hint of bitterness that whole wheat doughs can sometimes have and not make the bread sweet. The plainness of the roll makes it very useful. It soaked up the hamburger juices beautifully, but would make a great cold sandwich roll, too. It can also be used to simply sop up marinara sauce or topped with butter and jam. Store leftovers in an airtight container or aÂ plastic bag. They’ll be good for at leastÂ day or two longer. Combine 1 cup whole wheat flour, 1 cup water and the yeast in a large bowl and stir well. Let it stand, covered, for 1-3 hours (time is flexible here), until nice and bubbly. This “sponge” will probably puff up, too. This is fine. Stir the remaining flour, wheat bran, brown sugar and salt into the sponge. Add extra flour a tablespoon at a time until the dough pulls away from the sides of the bowl. Turn out onto a lightly floured surface and knead, adding extra flour as necessary to prevent sticking, for 6-8 minutes or until elastic. Place in a lightly greased bowl, cover with plastic wrap and let rise until doubled, 1 1/2-2 hours. Turn risen dough out onto a lightly floured surface and divide into 6 equal portions. Shape into rounds and flatten (so they’re approx. 3/4 inch thick) onto a lightly greased baking sheet. Cover rolls with a clean dishtowel and let rise for 45-50 minutes. Meanwhile, preheat oven to 375. 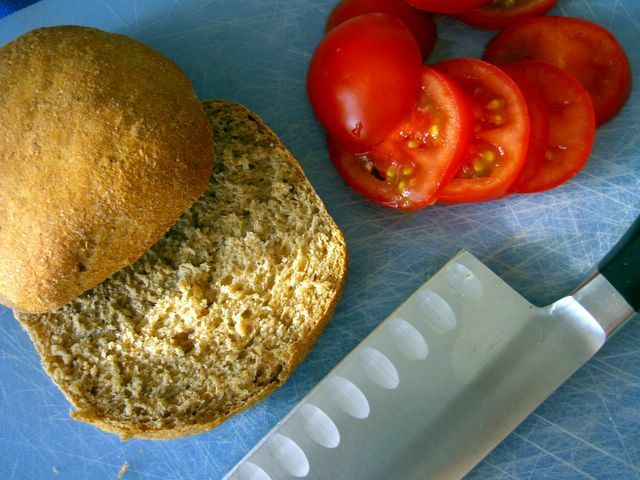 Bake rolls for 19-20 minutes, until browned. They will sound hollow when the bottom is tapped. Let cool on a wire rack before slicing. Hi Nic, I am definitely going to try these since I’m going to be making pulled pork sandwiches next week. On an unrelated note, do you think that I can braid the haiwaiian bread recipe and still have it cook normally? Or is it better to add more sugar to the challah recipe for a sweeter braided bread? Thanks! Is there any trick to getting them so beautifully round like yours? Josephine – You should be able to braid the hawaiian bread and have it come out the same. Just keep an eye on it in the oven! Amy – I pinch the four corners of my piece of dough together on one side, roll to seal and place the seam side face down. I don’t know that that’s the best description, but I’ll do a demo video if anyone knows how I can get it up on the site! These buns were great! Just as you described them – crusty on the outside and light on the inside – something I’ve never been able to do before with 100% wholewheat. The sponge at work here, perhaps? Thanks for the recipe – this may become my standard WW bread! Thank you for this recipe! I am vegan and can never find vegan hamburger buns. These are great! Thanks for developing this great recipe! I have been having a hard time making bread at home and your recipe came out perfect the first time? Have you noticed a difference in the buns using spring or winter wheat? What about the fine versus medium grind flour? Has anyone tried to use a different sweetener than brown sugar? Well, kudos and thanks for sharing the recipe! Sounds good, but you should call for fresh ground whole wheat. The difference between rancid whole wheat flour and heavenly fresh ground wheat is nothing short of remarkable. I wonder if you can help me!!!! I’m looking for a recipe to make sweet rolls…..when I made them, after I take them out of the oven they become hard….I don’t know if I’m putting to much yeast or not enough yeast or butter…please provide me with a recipe….I will really appreciate it!! Thanks and have a wonderful day!!! Thanks for a great recipe! These were delicious! Hi! I’d like to try making these in the next couple of weeks. I’m wondering if I can substitute wheat germ for the wheat bran though?? Sara – That substitution should work out just fine! Hi, want to try these. Would you happen to know the nutritional information on these buns? Trying to loose weight and would like to know if possible. How does baking temperature and cooking time change? Thank you SO much for the recipe! They turned out just like the photo. Instead of 6 buns I made 5 buns and two small rolls (so I could try just a few minutes after they came out of the oven – Yum). With no fat or milk I don’t expect that they will hold long. Like most other no-fat-added bread I have tried, they began to lose their super softness a little bit within a few hours on the counter. But they were still soft and made the best bean burger holder I’ve ever had. I think that putting them in a plastic bag as soon as cool would prevent even that. I put two in the freezer, to see how they would defrost and “come back”. If successful, I will double the recipe next time so that I can use the knead paddle on my stand mixer. I tried today but not enough dough to be well kneaded by my model. It was not a burden to hand knead them though. It was a lovely, supple dough. Next time I’ll be even more careful (as you suggest) to not add two much flour. I think I may have gone about a tablespoon farther than I needed. Wonderful recipe. This will definitely become a regular for me, whether I can freeze them or not. Thanks! I had been looking for something like this for a long time. I forgot to mention, I happened to have White Whole Wheat (King Arthur) and used that. As I hope you can tell, I thought they were fantastic. Message to all: do try them – they were easy to make and all of the time was in rises. The starter made all the difference. I can’t get over how good they were. Thanks again. These were wonderful… even after all these years 🙂 Thank you for the recipe! Jadie – Thanks, and good question. Whole wheat flour usually absorbs more liquid than all purpose flour does, so you’ll probably need to add a little extra (maybe up to 1/4 cup or so). Bread flour is very absorbent, like whole wheat flour, so the amounts will probably be very similar. Have a little extra on hand and add it if the dough feels too sticky and you should be fine.